During most of a year a dog needs general care and attention. During the extremes of weather, however, a rescue dog will need special care. This will ensure the dog's comfort during the height of summer and the depth of winter as well as ensuring his safety. Shade – dogs should never be left in the sun without the option of shade. If a dog is kept in a run in the garden, for instance, there should be ample shade where he can take himself away from the heat of the day. Ideally a dog should be kept in the house during the very hot weather as dogs often cannot tell when they are getting over heated. This is particularly important with rescue dogs who may not be used to roaming free in a garden. Conservatories and windows – if a rescue dog is going to be kept in a conservatory or in a room with large windows it is important to check that this does not get too hot during the day. The large panes of glass have the same effect as a greenhouse and can be dangerous for a dog to spend large periods of time in during the height of the day. Fluid – a dog will require plenty to drink during the hot weather. Plastic drinking bowls are better than metal ones as they will not get as hot as metal bowls. Very hot metal drinking bowls can cause the water to evaporate. Food - food should never be left down during the summer. Maggots can be quick to form in left over dog food. Dog food can also start to smell which can be unpleasant. Parasites – the warmer weather is the time when insects such as fleas and ticks become prevalent. Early prevention in the form of flea collar or other treatments will help to keep the dog free from parasites. Regular worming is also important and this can be done via the administration of pills or tablets. Exercise – never exercise a dog during the very hot parts of the day. The evenings and early mornings are the best time. Never force a dog to be more energetic than it wants, this can cause discomfort or for him to over heat. Cars – it goes without saying that a dog should never be left in an unventilated car. 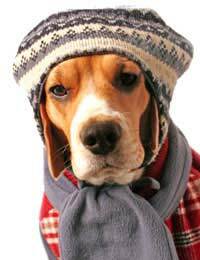 Dogs can suffer during very cold or wet winters. An adopted dog might require a little extra care and attention to keep him comfortable during this time. Warmth – dogs will seek out warm and comfortable areas. They won't always recognise, however, that some places are dangerous. A dog may get too close to an open fire or a kitchen stove and may burn himself. Often the first sign of this will be the smell of burning fur. Good safety guards around heaters and fires will help to keep a dog safe. Dogs may also try to climb into boiler rooms or other areas where there is heat and it important to make sure that these places are shut securely. Heated beds – keeping a dog's bed in a warm and safe area will help to stop him from seeking out other warm places. Putting his bed by a radiator will give him a warm cosy bed during the night. If this isn't suitable then a hot water bottle covered in an old blanket and put under his bedding might be a good option. It is possible to buy heated pet beds, however these can be expensive. Frost bite – if a dog is taken out into a cold and icy garden, field or park it is important to watch his feet and make sure that they don't get sore with the cold. Keep a particular look out for ice building up between the toes. If a dog does appear to have frozen paws, remove any ice that is visible. Don't suddenly heat up a dogs paws by putting them into hot water, instead let the temperature come up naturally in a warm room. When the temperatures are very cold it is best to limit the dog's exercise. Salt – the salt that is used to melt ice on roads and temperatures can make a dog's paws sore. Wash his paws well after he has come in from a walk on a surface that has been salted and gritted. Jackets – short haired dogs may appreciate a jacket to give them extra warmth. These can be purchased from pet stores or made from old jumpers. Not all dogs welcome these, however, and nervous rescue dogs may well be frightened or unsettled by the unfamiliar feel. Water bowls – water may freeze during the cold weather, therefore keep checking that the dog has access to fresh water. Metal bowls will help water to freeze and may even cause an ice burn. These are just some of the ways that a newly adopted dog can be made comfortable during the extremes of temperature. There are many others and local vets and animal welfare organisations may be able to provide specific information relative to a specific region.